by Brown, Kendall H.; Cobb, David M.
Japanese gardens are found throughout the world today—their unique forms now considered a universal art form. This stunning Japanese gardening book examines the work of five leading landscape architects in North America who are exploring the extraordinary power of Japanese-style garden design to create an immersive experience promoting personal and social well-being. Master garden designers Hoichi Kurisu, Takeo Uesugi, David Slawson, Shin Abe and Marc Keane have each interpreted the style and meaning of the Japanese garden in unique ways in their innovative designs for private, commercial and public spaces. 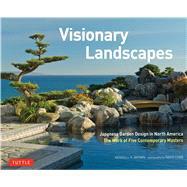 Several recent Japanese-style gardens by each designer are featured in this book with detailed descriptions and sumptuous color photos. Hoichi Kurisu—transformative spaces for spiritual and physical equilibrium. Takeo Uesugi—bright, flowing gardens that evoke joyful living. David Slawson—evocations of native place that fuse with the surrounding landscape. Shin Abe—dynamically balanced "visual stories" that produce meaning and comfort. Marc Keane—reflections on human connections with nature through the art of gardens. Also included are essays on the designers and mini-essays by them about gardens in Japan which have most inspired their work, as well as commentaries by patrons and visitors to their North American gardens. The book focuses on recently-created gardens to suggest how the art form is currently evolving, and to understand how Japanese garden design principles and practices are being adapted to suit the needs and ways of people living and working outside Japan today. Photographer David M. Cobb is a member of NANPA (North American Nature Photography Association) and PPA (Professional Photographers of America). He lives in the Pacific Northwest with his wife and their two cats.